It is impossible not to come away with a big smile after meeting Asah Azefor and Beltus Atunsiri. 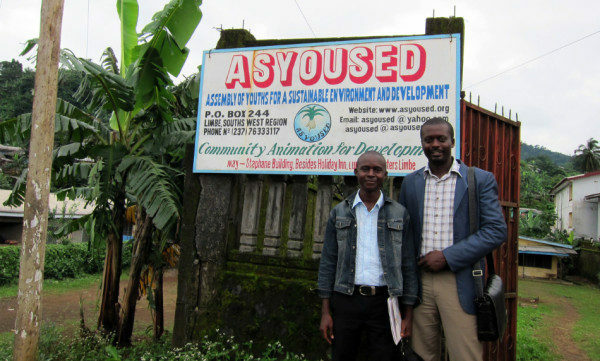 Asah is the leader and Beltus is his deputy of a Non-Governmental Organization (NGO) in the south-west Region of Cameroon, called ASYOUSED (Assembly of Youths for a Sustainable Environment and Development). These two young men are brimming with enthusiasm and are very eager to work for the good of their community. They both hold university degrees but decided after they graduated that government jobs were not for them, and thus, after gaining solid experience from several assignments as interns in existing NGOs, they created ASYOUSED. When the Cameroon government started decentralizing its Public Investment Budget (PIB) and devolving responsibility for the implementation of infrastructure projects to mayors (government appointed officials) and councillors (officials elected by their constituencies), Asah and Beltus noticed a gap between what councillors would have to do to select and monitor infrastructure projects in collaboration with their constituencies, and their actual skills in these areas. At that point they applied for PTF funding and technical assistance to improve communications between the Buea municipal council and the population. Jane Schubert, the PTF Adviser assigned to the project, insisted that ASYOUSED obtain official, written confirmation by the mayor of Buea, stating his support for the proposed initiative. This written guarantee was especially crucial since the relationships between the council and the local communities at large were not very trustful or cordial. What initially looked to Asah, Beltus, and Jane like a simple, straightforward procedure turned out to be the project with the longest gestation period of any in PTF history. The mayor and his councillors were very busy, and in a society where age is still an important factor in commanding respect, they did not have much time to spare for two young people intent on engaging communities in matters traditionally outside the influence of the local population. Nonetheless, in spite of their youth, Asah and Beltus did have plenty of good will, competence, and perseverance. Instead of being discouraged, they explained their ideas and built alliances with several councillors who were willing to listen, while repeatedly visiting the mayor’s office. Eventually, after about nine months, the mayor, impressed by their sheer tenacity, listened to their proposed action and wrote a letter of support to PTF, thereby triggering the release of the PTF grant to ASYOUSED. Since this initial engagement, the mayor has been a strong advocate of ASYOUSED, even chairing their first multi-stakeholder workshop. The first step was to build trust with the mayor of Buea, and obtain his written consent to undertake the project. By doing so, the mayor signaled that he was serious about transparent and honest dealings with government funds made available through the PIB. The consensus building effort with councillors was a less lengthy, but more complex process. There were 33 council members in the Buea council. At first, alliances were established, with a few champions – those council members who had expressed an interest from the beginning. These champions convinced others that the ASYOUSED approach would be good for their constituents and thus for themselves. The third and most complex level of engagement was with local communities. This involved managing relationships between multiple stakeholders such as councils, communities, and contractors. These relationships required a transformation from expectations of corrupt behavior to building up mutual trust and working on the common purpose of creating infrastructure (running water, electricity, roads, schools) for the betterment of communities. The ASYOUSED approach is well-documented, and can easily be replicated to other communities. The ASYOUSED team can build further on its success. Their initial effort paid off, and their enthusiasm is infectious to all who meet them. They are in a working relationship with the German GIZ, and are frequently asked to present their community engagement approach to organizations in other regions of Cameroon. They continue to be sought out by the mayor, councillors and communities alike for information and support in engaging local communities in decision making in PIB and other programs. They have established a communications program using SMS technology via cell phone to track the allocation and the final destination of public funds and in the process contribute to lifting their communities out of poverty.